mysore chicken.JPG, originally uploaded by jrambow. Don was in Mysore last week, and I took the train down to see him. Here's a chicken store near his work. The tinsel was probably applied during Dasara, the week before. 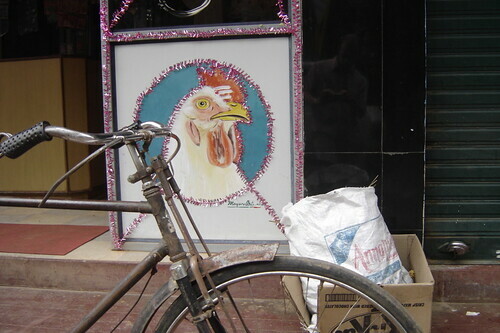 What I especially love is the mark of Shiva, the three parallel lines, on the chicken.